David Thoren isn't a snobby record store owner. When you walk into Groove Merchants, his newly opened shop in the Garland District, he's not going to quiz you on the most obscure bands you know. He just wants to chat about music and maybe turn you on to something new. Since opening at the beginning of the month, he says he's helped multiple college-aged kids purchase turntables and records. 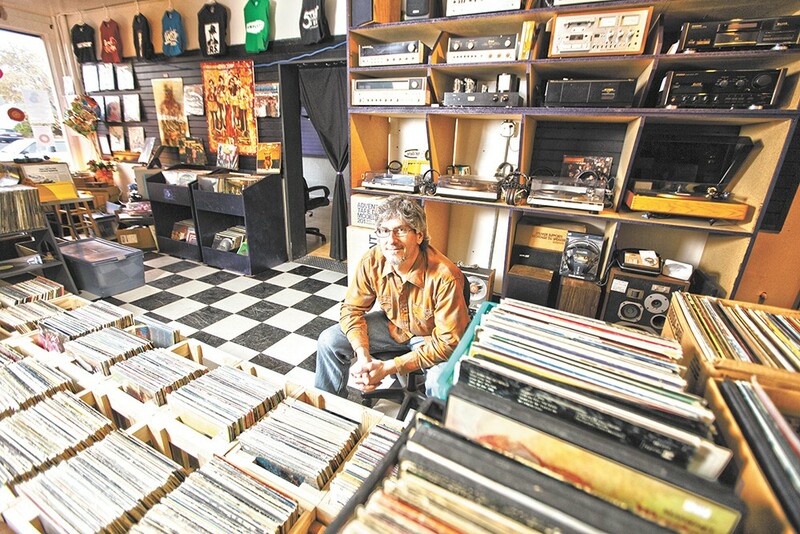 "That's why opening a record shop is viable," says Thoren at his business last week. "It's awesome that record collecting is not just all for old fogeys anymore. It's retro and cool, and people are realizing it sounds so much better." A whole new generation is hopping on the vinyl bandwagon. Over the past year, record sales have risen a whopping 40 percent, according to Nielsen SoundScan, with 4 million LPs sold in the U.S. alone. Thoren says he thinks of his business like a drug. He may toss in a free LP with a first purchase of a record player, just to give someone that initial taste. He knows they'll be back for more, whether it's at his shop or another in town like 4,000 Holes or Recorded Memories. "Records give you an immediate feeling," Thoren says. "They are a complete experience — with the tactile nature of it." Shop owner David Thoren settles into his new digs. For as long as he can remember, Thoren has wanted to own a record store. The 45-year-old recalls hanging out at Wenatchee-based Budget Tapes & Records as a kid. "I'd get out of school, go to the shop and help them put stuff away," he recalls. "I was totally the record store rat." When he moved to Spokane in 1992, he got a job at DJ's Sound City. But the regional chain closed in the late '90s; other music stores would follow. Thoren felt lost. He tabled his record store dream. In 1999, an optimistic Tony Brown opened Unified Groove Merchants on Monroe Street. A decade later, looking to downsize, he moved the business next door. "People thought I was closed," Brown recalls. Instead, he updated his inventory and added modern furniture and vintage clothing. Things got more confusing for Spokane record lovers when he switched the business' name to the Bachelor Pad. Brown's record collection dwindled. Customers accused him of not caring about records anymore. That's when he had the idea to get rid of them altogether, piquing the interest of Thoren, who had helped at the shop for the previous six years. With Thoren's Groove Merchants, Brown's record store gets a continuation with a slightly different name. Brown's original collection is sold at the new shop out of the same old record bins. This works well for Brown: As he puts it, he no longer has to sell Fleetwood Mac's Rumours or Led Zeppelin anything. Last week, he brought back a stack of personal favorites to the Bachelor Pad (moved yet again down the block to 2810 N. Monroe): the jazz/funk records he couldn't let go of. "It's the rare stuff that only 1 percent of Spokane, maybe three people in Spokane, would even be interested in," Brown explains. "It's what excites me." The fluorescent red, yellow and green records suspended in the storefront window catch the attention of curious passersby. "I watch them pressing their faces to the glass," Thoren says. "People can't believe there's a new record shop." 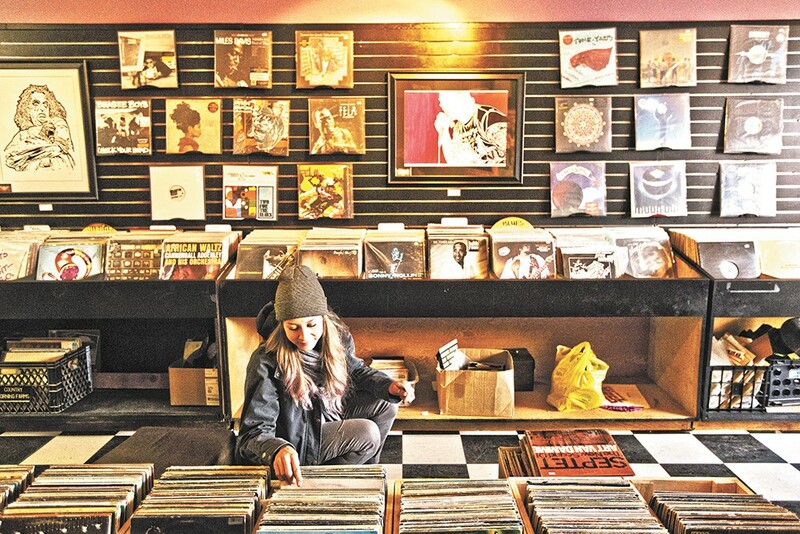 The store on Garland may seem removed from downtown's more profitable foot traffic, but in this classic North Hill small business district, Groove Merchants joins other music-based outfits like Mark's Guitar Shop and the Spokane Music Institute. Thoren says he sees a steady stream of daily customers who just happen upon the shop. While his space is compact, it still feels accessible. There are even rolling chairs for customers to employ while flipping through the bargain records in the middle of the floor. One side of the shop offers records and the other vintage audio equipment; much of this inventory is supplied by consignors. Music is on constant rotation here — jazz in the morning, moving to rock, then quiet music again in the evening. Rock 'n' roll-themed drawings and paintings by local artists line the walls. The place doesn't quite smell like a dusty record shop yet, but there's still time. Thoren is just beginning to feel moved in. More than anything, he wants this place to last. Now, he says it's about breaking even.